Nassau University Medical Center seeks to remove the longtime operator of its coffee and gift shop. Concessionaire Butch Yamali, right, blames the hospital for failing to make repairs, hurting his business. 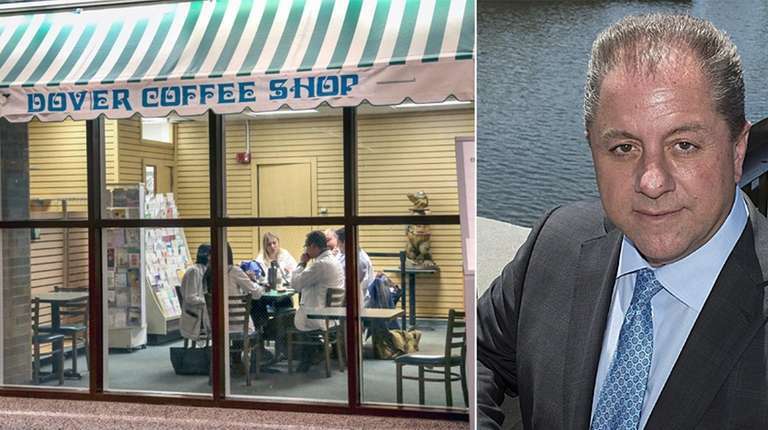 Photo Credit: Newsday photos / John Paraskevas; J. Conrad Williams Jr.
Nassau University Medical Center is pressing to remove the longtime operator of its coffee and gift shop over nonpayment of an estimated $400,000 in fees. Butch Yamali, who has had the concession to operate the Dover Coffee Shop since 2001, called the figure "fictitious." He blamed the hospital for failing to repair the kitchen's exhaust system, hurting his business. On Feb. 14, hospital officials ordered Dover Gourmet Corp., owned by Yamali, to vacate. NuHealth, the public benefit corporation that runs the East Meadow hospital, said Dover owes a total of about $400,000, and made its last monthly payment of $7,515.07 in February 2015. "The coffee shop concession has not paid rent in over four years. That is completely wrong, will not be allowed to continue, and we are exercising our legal remedies," George Tsunis, NuHealth chairman since February 2018, said in an interview. Yamali said he could not afford to pay fees after the shop's exhaust system broke, preventing grilling or frying. According to Dover Gourmet Corp., the hospital refused to fix the problems, and the company took a financial hit due to its diminished menu. NuHealth had ordered the company to vacate by March 31. Last month, lawyers for Dover filed suit against NuHealth for breach of the concession agreement. Under the terms of a court stipulation agreed to by both parties, Dover can stay until April 20. Per the stipulation agreement, the company has paid NuHealth $7,000 as a partial month's fee to remain until that date. In court papers, Dover said the Nassau County fire marshal "in or about" February 2015 barred cooking at the shop until the hospital replaced or repaired the hood/ventilation and fire suppression system. In an interview, Yamali recalled difficulties in dealing with prior NUMC administration. Yamali said he had been waiting to reach an agreement with the hospital that would have permitted renovations to reconfigure the shop so he could bake and cook foods, such as pizza and panini. Also, he said, “If I owed the rent, where's the bill? Why didn't they evict me two years ago? We have writings that say it’s OK to stay and not pay." Deegan said, "We paid a percentage of gross, and the gross had come way down since the cooking was closed." Tsunis said NuHealth offered Dover a $150,000 settlement last year, but Yamali "did not follow through." Deegan said there was disagreement over the wording of the settlement. "We owe no commissions and we were doing this in exchange for resolving those issues and making the place marketable again,” Deegan said. “It’s rent," said Tsunis. "Every deli, coffee shop, has a rent payment to their landlord … In no other construct is not paying rent for four years and one month allowed, or acceptable." Yamali, a longtime county vendor, has had exclusive rights to provide concessions at Nassau County parks and beaches and operate vending machines in county buildings, according to county audits. Yamali testified last year in the first federal corruption trial of former County Executive Edward Mangano, his wife, Linda, and former Oyster Bay Town Supervisor John Venditto. Yamali testified he had believed he was going to get a county contract to provide food for emergency workers after superstorm Sandy in 2012. The contract ultimately went to restaurateur Harendra Singh, a friend of the Manganos. Venditto was acquitted, and the case against the Manganos ended in a mistrial. Edward Mangano was convicted in a retrial in March of charges including conspiracy to commit federal program bribery and conspiracy to obstruct justice. Jurors found Linda Mangano guilty of conspiracy to obstruct justice, obstruction of justice and two counts of lying to the FBI. Edward Mangano has said he and his wife will appeal their convictions. Tsunis said if Dover is removed from NUMC, the hospital will open an employee cafeteria to the public, or staff Dover's shop with employees of the cafeteria. NuHealth, which has an operating budget of $585 million, posted a $25.7 million operating loss in 2017, NuHealth financial statements show.